In these lessons, we will look at angles at standard position and coterminal angles. An angle is said to be in standard position if it is drawn on the Cartesian plane (x-y plane) on the positive x-axis and turning counter-clockwise (anti-clockwise). The initial side of an angle is the ray where the measurement of an angle starts. The terminal side of an angle is the ray where the measurement of an angle ends. Co-terminal angles are angles which when drawn at standard position share a terminal side. For example, 30°, -330°, 390° are all coterminal. 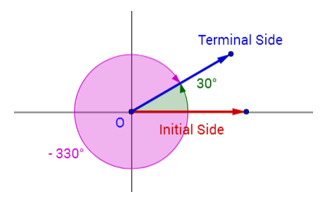 The following diagram shows the coterminal angles 30°, -330°. Scroll down the page for more examples and solutions. Coterminal angles of a given angle θ may be obtained by either adding or subtracting a multiple of 360° or 2π radians. Coterminal of θ = θ + 2π × k if θ is given in radians. Two angles are coterminal if the difference between them is a multiple of 360° or 2π. How to find Coterminal Angles? This video discusses what it means for two angles to be coterminal, and discuss a quick method on how to decide if two angles are in fact coterminal. It also shows a couple of examples of finding angles that are coterminal to each other. a) Which of the following angles is coterminal with an angle of 135°? b) Which of the following angles is coterminal with an angle of 135°? How to decide if angles are coterminal or not? a) Which of these is NOT a pair of coterminal angles? Coterminal angles are two different angles (rotations) with the same terminal side. 1. What is the first positive angle coterminal with 96°? 2. What is the first negative angle coterminal with 96°? 3. What quadrant does the terminal side lie in for an angle of 920°? 4. What quadrant does the terminal side lie in for an angle of -1100°? 1. What is the first positive angle coterminal with π/6? 2. What is the first negative angle coterminal with π/6?